It all started when Mr. Say Lip Hai arrived in Singapore from Hainan island and started as a cookboy with the British troops in Sembawang learning how to prepare the perfect roast beef and Yorkshire pudding. After learning the skills, he started his first restaurant, which was called Cola Restaurant and Bar in 1967. The restaurant served the British and Commonwealth troops and their families residing in Sembawang neighborhood. Mr. Say Lip Hai's break came in 1969 when a British housewife tasted the steak prepared by him and suggested that he start a catering business in her husband's pub in Killiney Road. Her husband's name was Jack Hunt. Mr. Say agreed with the condition that he take over the whole kitchen operation leading to the birth of the famous Jack's Place Steak House. Jack Hunt sold the business to Mr. Say in 1972 and relocated back to England. Today, the company is led by an aggressive management team, comprising of 2nd and 3rd generation family members and professional managers. Do visit them and try out! 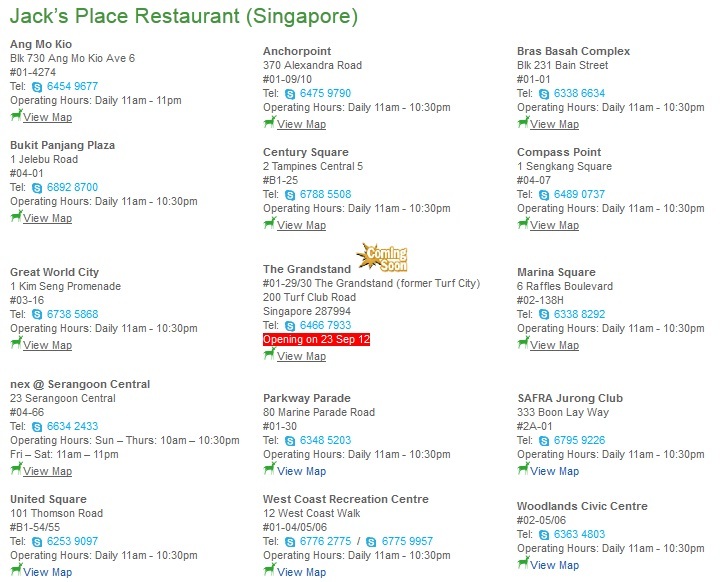 All the outlet in Singapore! Let me know ya after trying!